These two bearded Collies Anri & Bebe always give you warm welcome and friendly greetings to you when you visit our Ashiya head office. We named our Yoga Mats after them. The Butterfly on our products represents Relaxation and Sustainability. Send it back! We recycle your used Yoga Mat to secure a sustainable future. Contact us for further information. Operated by TRI ALL 3 JAPAN Co., Ltd.
Why Anri & Bebe Ecological Yoga Mats are so specific !? – The reason is 5 mm thick Anri & Bebe Ecological Yoga Mats return to the soil after disposal. They are made from Eco-friendly material called TPE. – Aren’t 5 mm thick Anri & Bebe Ecological Yoga Mat too heavy? 2 mm thinner,10 cm shorter PVC Mat. - Anri & Bebe Ecological Yoga Mats are hypoallergenic　and safe for sensitive skin. 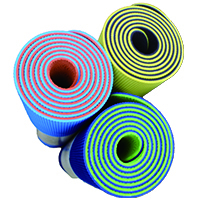 - The surface of Anri & Bebe Ecological Yoga Mats do not get blackened as PVC Mats do. 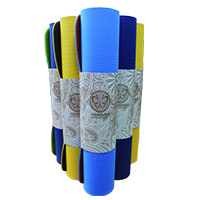 - Anri & Bebe Ecological Yoga Mats do not have an unpleasant odor like PVC Mats do. – PVC Mats contain thousands of tiny interconnected bubbles; moisture from washing and exercise gets deep inside of Mats and takes a long time to dry. When the mats are moist, bacteria and　mould grow around the tiny holes, causing surface to blacken. making maintenance very easy – a quick wipe will do. – Anri & Bebe Ecological Yoga Mats with specially designed non-slip patterns on both surfaces hold you to the floor firmly while you exercise. You can really feel the difference!! – PVC contains many chemicals which are very difficult to return to the soil and may produce Dioxin when burned. – Anri & Bebe Ecological Yoga Mats is made with Thermo Plastic Elastomers which returns to the soil easily after disposal. We also take great care of using binders and sealing adhesives to make our products as much Eco-friendly as possible. We are proud of them. – We believe things which are Eco-friendly are also Human-friendly. We believe we should be sustainable to our Earth then. about 1000 g/pc. 1750 x 61 x 6 (mm)　1500 g/pc. Copyright© Yoga fitness All Rights Reserved.